First, a definition of EQ. It is different from IQ, Intelligence Quotient, which provides a score just for your intellectual ability. 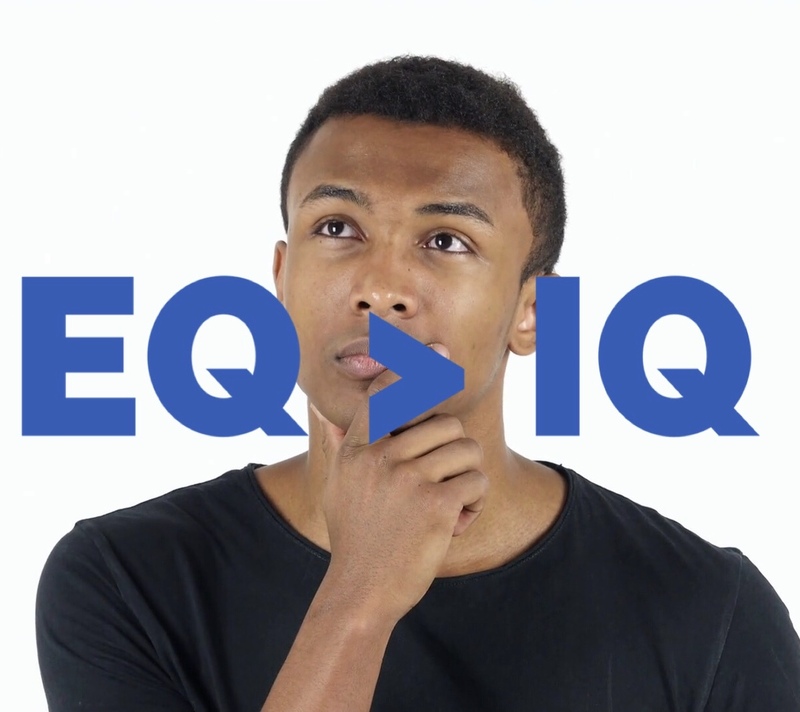 EQ has been around since the 1960s but came to the fore in the late 90s when Daniel Goleman argued that there was more to human competence than mental intelligence in his best-selling book “Emotional Intelligence: Why it can matter more than IQ”. Goleman, a scientific journalist, declared that 80% of a person’s success was down to EQ and 20% to IQ, their basic intelligence. The good thing about EQ is that it can be learnt – you can practise to achieve emotional intelligence. 1) You avoid confrontations – Survival is the primary instinct of mankind. Fight or flight when challenged. Both can be positive virtues. But if you avoid confrontation all the time you cannot overcome your negativity and your fears, both of failure and success, and emerge on the positive side of life. 2) You find it difficult to speak the truth – In this case, you can’t speak your own truth. i.e. stand up for what you believe in. 3) You have no confidence in your own judgement – Your perceptions and verdicts on life, people and events do not make sense to you. 4) You don’t get to the heart of an issue – Heart is equivalent to courage (from the French ‘coeur’ or heart). 5) You hesitate to try new things –There is an old saying or proverb, ‘He who hesitates is lost’. The world is changing fast, and it is very difficult to solve the problems of today by using the methods of yesterday. 6) You avoid challenges – Similar to 1). But a challenge does not have to be confrontational if you approach it with confidence, awareness and the aim to succeed come what may. 7) You can’t defend ideas – We all have our favourite ideas and philosophies. You must learn to defend your own values, perhaps hone them, so that you develop a coherent purpose. 8) You give up easily – To succeed in life you need the motivation to keep on keeping on. 9) You question your own ability – As in 3) you have no self-belief. 10) You avoid taking risks – To take risks requires confidence, good judgement and self-belief. 11) You feel powerless – In other words you don’t have the mental and emotional strength to meet challenges, speak your truth, defend your ideas, try new things or get to the heart of the matter. This is an overarching principle. * Awareness: This is the essential trait to meet all emotional challenges. It means staying in the present and watchful when emotions are triggered (usually by the memory some incident in childhood, which may have been small, and is probably forgotten). * Social skills in relationships: The main skills in relationship are communication. That in turn means clear and honest dialogue where you listen to the other person or persons as carefully as you talk. * Empathy: Take account of other people’s feelings. [Sympathy is completely different. That is when you are sorry for someone and take pity on them]. * Motivation: The desire to succeed for the sake of it, according to Goleman. These attributes help people come to terms with what Goleman describes as the primary emotions: anger, sadness, fear, enjoyment, love, surprise, disgust and shame. In this list ‘surprise’ seems to be the surprise, but it is simply a big unexpected event or challenge. Also missing is jealousy, which Goleman describes as a “variant of anger that also melds sadness and fear”. Critics and the proponents of IQ have claimed that Goleman’s EQ is a learned behaviour rather than natural intelligence. In any case EQ provides a more balanced and rounded description of the human psyche and competence – the fact that it can be practised and improved is to its advantage.